This doesn’t mean that these pages won’t rank or can’t rank. As Mueller notes, “if you think you need pages to sell your products/services better, make them.” And that wouldn’t be seen as losing value if they are high quality pages. 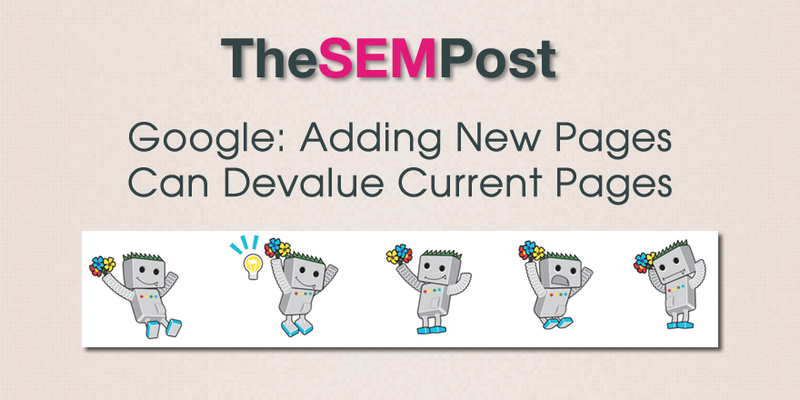 But webmasters should decide why they are adding these pages – is it to add new pages to Google or is it because site visitors will find value in these pages and want to visit them? If it is the former, you may want to rethink that strategy. Many site owners feel the need to add pages for the sole purpose of adding more pages to Google, even if those pages aren’t the highest quality or even pages that visitors would want to visit, without thinking of the overall impact of those new pages. And even small sites can perform very well against much larger sites, so more pages isn’t a requirement to rank well in Google, or to rank for more keywords. Google has no issue with ranking a single page for a high number of keywords or a variety of keywords, if the page is high quality and has value to searchers. It comes down to an often repeated mantra from Google – create content for users, not Google. And site owners will need to consider that “a little bit less” in their overall strategy if those pages aren’t being created purely for user value. Usually you can’t just arbitrarily expand a site and expect the old pages to rank the same, and the new pages to rank as well. All else being the same, if you add pages, you spread the value across the whole set, and all of them get a little bit less. Of course, if you’re building up a business, then more of your pages can attract more attention, and you can sell more things, so usually “all else” doesn’t remain the same. At any rate, I’d build this more around your business needs — if you think you need pages to sell your products/services better, make them.